The New Jersey Devils came into tonight hanging on to slim playoff hopes. Throughout the week the Devils have known they must win almost every game to sneak into the playoffs. Taking one game at a time, the Devils welcomed in the Phoenix Coyotes. With 3 days in-between games, Coach Deboer began experimenting with Eric Gelinas at left wing. Coach Deboer acknowledged the experimenting but stated there was nothing set in stone due to a flurry of injuries. During warm-ups the Devils had dressed only 6 defensemen, Gelinas being one of them. The Devils came out with good energy in the first period, but the Coyotes were ready to match the intensity. 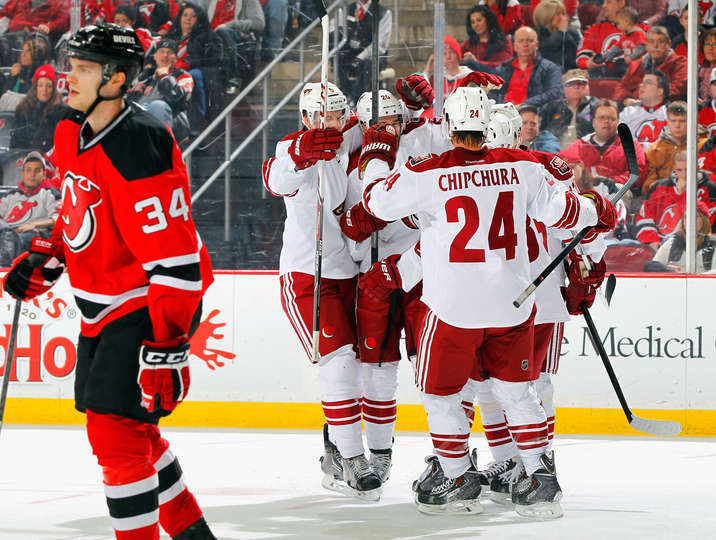 The Devils found themselves running after Coyotes and their energy turned into sloppy play. New Jersey’s sloppy play resulted in a Phoenix 1-0 lead. Kyle Chipchura scored his 4th goal of the year, assisted by Korpikoski and Summers. New Jersey got into penalty trouble in the second half of the first period racking up 3 penalties. Although some calls could be considered questionable, or inconsistent. Although New Jersey were short-handed 3 times they successfully killed off all 3 penalties. However, because they were short-handed for 6 of the last 10 minutes the Devils only registered 4 shots on goal in the period. The second period started off with Clowe in the penalty box for 3 seconds. The Devils came out and were aggressive. They registered a shot on goal within the first 30 seconds of the period. New Jersey than drew a penalty at 2:11. While on the power-play John Merrill rang a shot off the inside post. The second period seemed to more of an even match of energy. The Coyotes extended their lead at 16:57 of the second period when Chris Summers scored his 2nd of the season, assisted by Chipchura and Vrbata. The Devils looked like they were going to be going into the third period down 2-0 when Ryane Clowe scored his 6th goal of the season at 19:59 of the second period, assisted by John Merrill and Jacob Josefson. The goal would be reviewed by the officials because Clowe redirected a shot from Merrill as he was falling. The officials ruled it to be a good goal with 0.3 seconds left in the period. The Devils outshot the Coyotes in the period 13-6, and would lead the Coyotes 17-14 for the game. Like most of the season the Devils came out and looked like the better team in the third period. Especially with the added emphasis on the last 10 games the Devils continued to pressure the Coyotes and Adam Henrique cracked through and tied the game at 10:32 of the third, scoring his 24th goal of the season, assisted by Patrik Elias. The Devils continued to play with energy and extended the game into overtime. Coach Deboer started overtime with Elias-Henrique-Gelinas-Zidlicky. It looked to have paid off when Zidlicky found a free Patrik Elias that was denied by Greiss on a one timer. That foursome would prove to be the most effective in overtime creating a flurry of chances but not able to breakthrough for the game winner. The Devils found themselves in the first shootout since January 16th needing the important second point looking at 12 straight losses in a row in the shootout. Coach Deboer chose Brunner, Clowe, and Elias as his three shootout shooters. The Coyotes coach Tippett chose Boedkar and Vrbata, as his shootout shooters. All three Devils shooters were unsuccessful and Boedkar was the only successful shooter. The Devils continue their shootout woes as it is now 13 straight shootout losses. Although the Devils lose an important game, they still earned a point and now sit 4 points behind in the playoff chase. The Devils also received some scoreboard help as the Red Wings lose in regulation to the Canadiens. With the remaining schedule the Devils still have a shot but need to find consistency, something they haven’t been able to do all season.